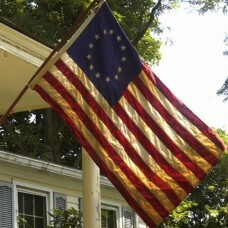 Shop for authentic replica Bunker Hill flags. Our Bunker Hill flags are constructed of durable nylon with a canvas heading and offered in five sizes. The Bunker Hill Flag is one of many emblems originally created during the American Revolutionary War. Like others, its design has changed and developed over the intervening centuries. It is emblematic in many ways, and the historical event to which it refers is very well known indeed. The Battle of Bunker Hill is one of the many pivotal engagements of that war which is recognized, by Americans especially, as a landmark in their country's history. Another well known name for the Bunker Hill Flag is the Flag of New England. This part of North America was the first to declare independence from the United Kingdom of Great Britain and Ireland, in 1776. The Declaration of Independence, on 4 July of that year, was part of an ongoing struggle against the British Empire which is commemorated on the Bunker Hill Flag. What is now called the Bunker Hill Flag was originally created during a time of war. This meant that both time and resources were limited. Its original design is believed to be much different to the one which goes by the Bunker Hill name. The main difference from the original is believed to be the background color. The Bunker Hill Flag is largely a deep blue color, with a white canton at the hoist side. It is now believed that the flag flown at the Battle of Bunker Hill in 1775 was actually red. 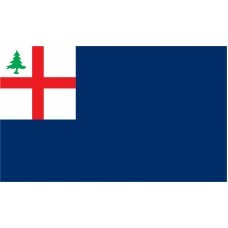 On this red flag was a white canton with a green pine tree, representing New England. It is thought that such flags were carried into battle by American Revolutionaries in the region, fighting British colonial troops and their allies. A simple red design made an excellent contrast to the British Union Flag of multiple crosses on a blue background. As the American forces pushed the British back, the Bunker Hill design became more and more popular. Unfortunately, it is thought that a flag chart maker changed the red to dark blue. That legacy is part of the Bunker Hill Flag to this day. Also included in the canton of the modern flag is a Saint George's Cross. This in actual fact represents England. The original green pine tree of the Bunker Hill Flag sits in the very top left corner of the modern version flag, at the hoist side. Originally, this tree was intended as a symbol of New England's independence from the British Empire. Both the blue color of the Bunker Hill Flag and the incorporation of the English Saint George's Cross are seen as mistakes in many people's eyes. However, the Bunker Hill Flag is still flown outside of many homes and buildings as a symbol of the success of the struggle for American independence. Bunker Hill was an iconic moment in American history, and one which was successful thanks to the efforts of everyday people. While the design of the modern Bunker Hill Flag may differ from the original, it still maintains its meaning for many Americans.